Ricies contain carbohydrates, B vitamins and iron, and they're also contain no artificial colours, flavours and preservatives. We've been making Ricies in New Zealand for New Zealanders for over 70 years. 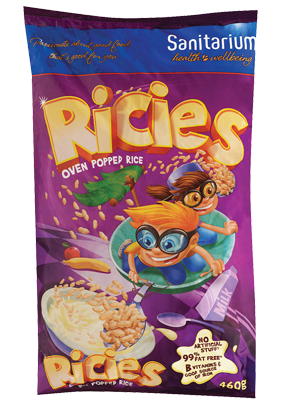 Rice (89%), sugar, salt, barley malt extract, mineral (iron), vitamins (niacin, thiamin, riboflavin). 460g, 275g: Contains gluten containing cereals. 22g (in Breakfast Tray) ONLY: Contains gluten containing cereals. May contain milk, soy, sesame, sulphites and tree nuts.